Here is another photo taken with parents 127 Kodak at Scarborough coach station in the summer of 1965 I am afraid it is a little out of focus. Each of this pair of AEC Reliances according to what I can find out were owned by separate companies but garaged under the same roof I strongly suspect. KBV 251 was purchased new by Batty Holt, Blackburn Lancashire whilst KBV 252 was purchased by Ribblesdale, Blackburn Lancashire and apparently had a fleet number of 41 in their fleet. The company name of Batty Holt seems to have disappeared but Ribblesdale Coachways Ltd is still registered as a non trading company in Halifax Yorkshire. These Yeates bodied coaches were probable top of the line in luxury coaches when new in 1958 and the amount of flashing if that is the correct word for it certainly makes them stand out in a coach park. The running gear on these two was either the AEC 6.75 or 7.7 litre diesel engine I would of thought the later with a coach body, through a five speed synchromesh gearbox and vacuum assisted braking. One of the best journeys of my life was an overnight on the Ribble Glasgow to Manchester service, as a student, in 1974. There was a duplicate on the 22:30 August departure – a Ribblesdale 4MU3RA Plaxton Panorama. I’m known for my preference for heavyweight, long Reliances but this was a beautiful, smooth and sprightly ride. Two other things stick in the memory. As a driver for an independent, he seemed friendlier than the regular service drivers but he didn’t know where he was going and hadn’t been briefed properly. We initially got lost in a large housing estate in the suburbs of Glasgow. A superb coach, well driven, made up for it. Ribblesdale Batty Holt were indeed one and the same. The company was actually owned by O & C Holdsworth of Halifax, being part of their transport empire. 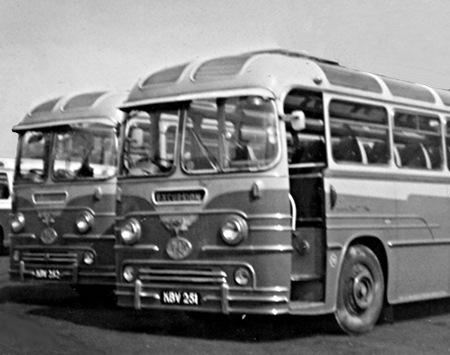 One of the items common to all O & C companies was the use of Gothic script initials in stainless steel on the side of the coach, in this case BRH with a large R flanked by a small B and small H. The same applied to OCH, W & H (Walton and Hellewell) and WRS, (W Robinson and Sons, who are still owned by O & C). I would be pleased to hear from anyone with photos from any of these operators, particularly form the pre underfloor era. I was never the greatest fan of Yeates bodies, but this model, which I’ve never seen before, is very attractive. despite the amount of what we could nowadays call ‘bling’!